Root canal therapy refers to an endodontic procedure that’s performed on a tooth that has extensive decay or that’s suffering from high levels of infection. The treatment procedure involves the removal of nerve and pulp inside the root canal after which the tooth is cleaned and then sealed. The root canal is the cavity located in the center of the tooth. 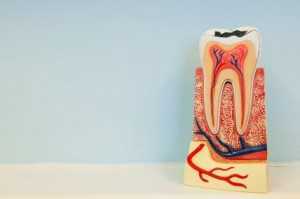 The pulp and tooth’s nerves lie within the canal. Once a tooth has emerged through the gums, the nerves cease being vitally important to the tooth’s health. The only function that nerves serve at this point is sensory, so in case of an infection, it’s quite safe to remove the nerves. An abscess (pus) will form. The area will swell and this swelling might spread to other parts of your face, neck and head. The tooth might start draining into the gums, cheeks and skin. What factors cause damage to the nerve and pulp? X-rays are taken to show the root canals and to check for infection in the bone. The area surrounding the tooth will be numbed using anesthesia. A rubber dam is fitted around the problematic tooth to keep it dry during treatment. The dentist or endodontist will drill an access hole into the tooth through which he will remove pulp and decayed tissue. This process is done using files of different diameters. During the filing, sodium hypochlorite and/or other medications will be used to flush the area. When the tooth has been thoroughly cleaned out, it’s treated and sealed. Sealing paste and gutta percha, which is a rubber compound, are applied into the root canal cavity. The exterior hole that the dentist drilled is also filled with tooth filler. Depending on how weakened your tooth is, you might require to get a crown fitting to protect the repaired tooth. Anesthetic is administered to numb the area during a root canal, therefore you shouldn’t experience any pain. After you get root canal therapy, your tooth might feel sensitive for a few days. This can, however be controlled with the use of over the counter pain killers and medication. After a day, you should be able to return to your normal routine. You should brush and floss your teeth regularly and keep your dentist’s appointment. If you engage in sports, you should wear a mouth guard to keep your teeth protected.